The DES-1016D 16-Port Fast Ethernet Unmanaged Desktop Switch is designed to enhance workgroup performance while providing a high level of flexibility. Powerful yet easy to use, this device allows users to simply plug any port to either a 10Mbps or 100Mbps network to multiply bandwidths, boost response time and satisfy heavy load demands. With the D-Link DES-1016D, you can easily expand your network by adding more computers or devices with speeds up to 200 Mbps per port in full-duplex mode. The DES-1016D use auto-sensing 10/100 Mbps ports, allowing a small workgroup to flexibly connect to 10 or 100 Mbps devices to create an integrated network. Each port automatically adjusts for straight-through or crossover cables to make the right link. 802.3x flow control on each port minimizes dropped packets when the port’s receiving buffer is full. The switches provide 802.1p priority queues for QoS, allowing users to run bandwidth-sensitive applications such as multimedia and VoIP Internet telephone without data flow bottlenecks that can degrade the quality of the network connection. The switches support IEEE802.3az EEE which enables the switches to reduce power consumption when the switches are at low utilization, allowing users to save on power usage and costs. During these periods of low utilization, the switches can enter a low-power state and use up less power than regular operations. The DES-1016D 16-Port Fast Ethernet Unmanaged Desktop Switch is designed to enhance workgroup performance while providing a high level of flexibility. 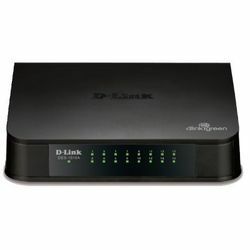 Powerful yet easy to use, this device allows users to simply plug any port to either a 10Mbps or 100Mbps network to multiply bandwidths, boost response time and satisfy heavy load demands.Ideal for Basic Networking TasksWith the D-Link DES-1016D, you can easily expand your network by adding more computers or devices with speeds up to 200 Mbps per port in full-duplex mode.Auto-Sensing 10/100 PortsThe DES-1016D use auto-sensing 10/100 Mbps ports, allowing a small workgroup to flexibly connect to 10 or 100 Mbps devices to create an integrated network. Each port automatically adjusts for straight-through or crossover cables to make the right link.Flow Control for Secure Transmission802.3x flow control on each port minimizes dropped packets when the port’s receiving buffer is full.Quality of Service (QoS)The switches provide 802.1p priority queues for QoS, allowing users to run bandwidth-sensitive applications such as multimedia and VoIP Internet telephone without data flow bottlenecks that can degrade the quality of the network connection.Save on Energy CostsThe switches support IEEE802.3az EEE which enables the switches to reduce power consumption when the switches are at low utilization, allowing users to save on power usage and costs. During these periods of low utilization, the switches can enter a low-power state and use up less power than regular operations.